Flynnkd Games (AustWiz): Sudden creative urges. Time flies since my last post. A month ago I got a sudden urge to be creative, writing and proto-type wise. So initially I started work on my Savage Worlds campaign/rule set - Aegyptvs. Obviously set in ancient Egypt, but with a lot added in. I ran the campaign that goes with the rules set a number of years ago and it was probably the best one I have done, even my players said so. Anyway work progresses on that. I put a lot of thought and effort into this one, and I am pretty happy with it. We had a playtest last weekend with 3 friends, of various skill levels in boardgaming, and this was pretty good. The mechanics worked well, which is a good start. So I am encouraged enough to move forward with it. It actually looks pretty good if I do say so myself. We got a professional artist to paint the original map (back before digital), and then had a bunch of maps printed. I got the maps scanned and spent a lot of time playing around with Paintshop getting a nice colour and feel. I then used MS Image Composer (my god this is a useful tool, why on earth did MS drop it?) to put all the components (area boxes) onto the original map. The original map had a hex grid, which is visible still, although I have de-emphasised it. 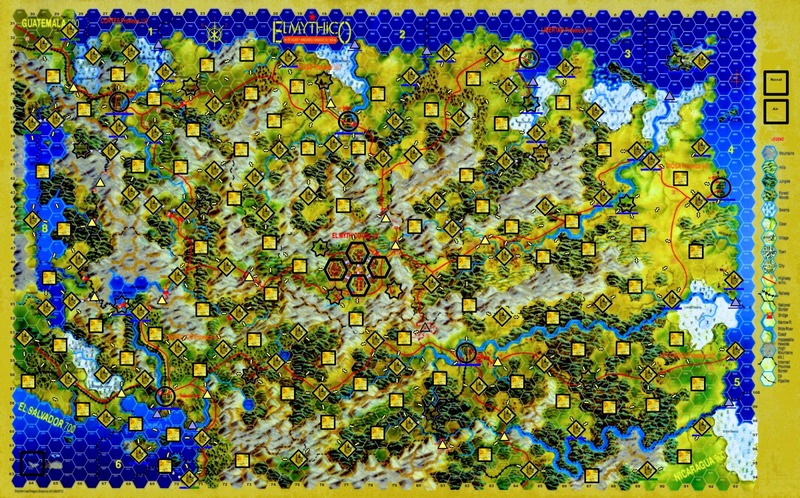 I like the hex grid, it reminds me of serious wargames. ELM-TBG however uses an area based system.